According to some of my friends, iNetBet Casino is an online casino I had to visit and experience it for myself. Therefore, I headed to this Realtime Gaming powered casino and found a well organised, pleasant to the eye website to investigate. Of course, what interests me the most, as a US blackjack player, are the banking options and the blackjack game selection available at the casino. In order to find out more about the games I clicked on the games preview where I could see the whole game selection at iNetBet Casino. Besides the Classic Blackjack, I was able to play another favourite blackjack variant called Pontoon as well as five more blackjack variations. iNetBet Casino didn’t disappoint me with its payment method choice either so I continued my adventure at this casino that exists since 1999. 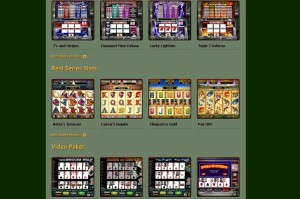 I already mentioned that the games at iNetBet Casino are provided by Realtime Gaming. Almost every casino that uses this software offers the same seven blackjack variants; in my opinion, every casino should feature Pontoon, Classic Blackjack and Perfect Pairs Blackjack, just like iNetBet Casino does. Additionally, in case I get fed up by these three games, I can try Match Play 21, Super 21 and Face Up 21. All three variants are unique and extremely exciting; hence I like playing them now and then. 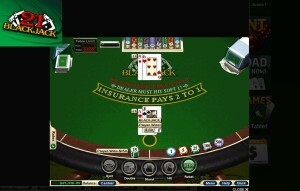 The last blackjack game available at iNetBet Casino is European Blackjack. I was happy to have the opportunity to try the games in fun play mode; nevertheless, I had to register an account first. Even though the main reason why I visit online casinos is the blackjack games, from time to time I like spinning the slot reels or the roulette wheel. That is why I always check the other game selection right after I try the blackjack variants. 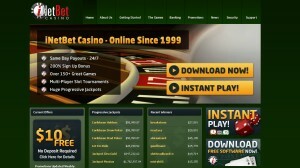 iNetBet Casino features over 100 games that can be played instantly or via downloadable software. I like card games and Let Em Rime, Red Dog and Pai Gow Poker stole a smile from me. Roulette, Keno and Bonus Bingo made me happy as well. I was also very excited by the wide classic and video slot selection that features Diamond Mine Deluxe, Lucky Lightnin, Pay Dirt and Cleopatra’s Gold. iNetBet offers a choice of 2 welcome bonuses. One for card players and the other for slots players. The 100% welcome bonus up to €250 for card players, requires you to use the coupon code NEW100. Interestingly, there are no game restrictions for this bonus but you must play through the deposit and the bonus 60 times before requested a withdrawal. If you decide against the 100% up to €250 offer designed for all players, you can take the 200% first deposit bonus up to €500 which is dedicated to slots fans. The code for claiming this bonus offer is NEW200 and the wagering requirements are 40 times the bonus + deposit amount. You’re restricted to playing on slots, scratch cards and Keno only for this bonus. 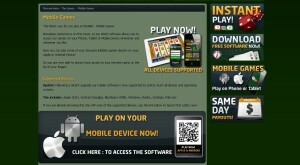 iNetBet Casino surprised me with its mobile casino. Not only they have a mobile casino with over 20 mobile games such as Blackjack Cleopatra’s Gold and T-Rex, but they also upgraded the software so this casino can be accessed via many tablets and smart phones. I played on my Android device and the experience was great. Some other operating systems that are supported are iOS, Blackberry OS, Windows Phone and even Symbian. In order to visit the mobile casino I scanned the provided QR core. I also had the option to click on the link and get access to the casino. iNetBet Casino, in my opinion, tried and succeeded to offer a very positive casino experience that is available 24/7 to customers. iNetBet Casino accepts 10 payment methods in total. Nevertheless, I was able to fund my account only through Visa, Click2pay and wire transfer. The other payment options available to international players were Skrill, Neteller, Ukash, EcoPayz, EntroPay, EziPay and OKPay. iNetBet Casino accepts withdrawals via most of the payment methods as well as via personal cheque. As a US player, the withdrawal options available to me were e-wallets, wire transfer and cheque. The minimum wire transfer deposit amount is $500, whereas the minimum wire transfer withdrawal amount is $250. All iNetBet accounts are held in Euro, and all funds that are deposited using any other currency will be converted to Euro at the current bank exchange rate. iNetBet Casino is definitely one of the reputable casinos that accept US players and offer good blackjack game selection. I was satisfied with the graphics and sound effects of the games as well as with the payment method choice. Furthermore, the casino has a very well developed mobile application allowing blackjack fans to play the game 24 hours a day, every day of the week regardless of their location. Finally, some other aspects that left a positive impression on me were the fast cash outs, generous promotions and aesthetic feel to the site. All in all, I would obviously recommend iNetBet Casino to everyone who lives in the USA and likes blackjack.